What makes a religion, anyway? Historically, Christian churches have served as community centers for their congregants, provided those congregants conformed to a certain moral code. More recently, thanks to the evangelical movement’s (re)positioning of itself as the “moral majority” in the wake of Roe v. Wade, those functions have evolved into something blatantly political, as evidenced by that community’s hypocritical embrace of twice-divorced adulterer Donald Trump. So why not take the good parts of religion—the camaraderie, the organization—and use them to advance a more liberal moral and political agenda, one that values pluralism and bodily autonomy over all? And as long as you’re fighting back against creeping crypto-fascist theocracy, why not do it in the name of Satan? He has the best music, after all. That’s basically how The Satanic Temple came to be, as it’s depicted in documentarian Penny Lane’s new film about the group, Hail Satan? Thanks to the theatrical nature of TST’s actions—and the resulting media coverage of same—Lane had access to a massive trove of footage that goes all the way back to the group’s first action, a satirical rally in support of Florida governor Rick Scott in 2013. 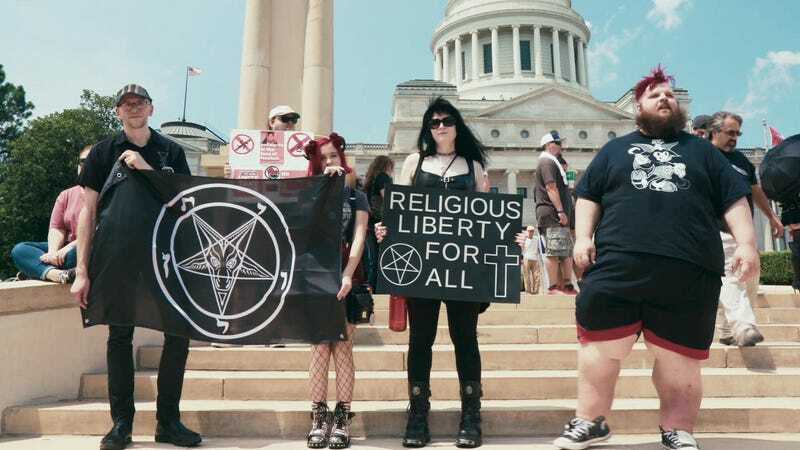 That was before TST coalesced into an honest-to-goodness atheistic religion, a trajectory that’s traced in loosely chronological order up to the unveiling of a Baphomet statue at the Arkansas State Capitol in August 2018. Along the way, we pause for truncated histories of evangelicalism in America, the late Anton LaVey and his Church Of Satan, and the Satanic Panic of the ’80s. At times, the straightforward structure holds the film back, particularly when the TST’s actions begin to repeat themselves toward the end of the film. Still, Hail Satan? has interesting points to make throughout. Even this admitted fellow traveler learned a few things, like that many of the Ten Commandments monuments that litter state capitols across America were originally installed as promotional stunts for the 1956 movie. Rank-and-file TST members appear in talking-heads footage throughout Hail Satan?, and some of them—like Arkansas’ Mason Hargett, a regular country lawyer in his blue blazer and plaid bow tie—defy all expectations of what a satanist looks like. But the majority of the TST’s history and philosophy is articulated by two people: reluctant spokesman Lucien Greaves (not his real name, and neither is the “real name,” Douglas Mesner, reported online), and Jex Blackmore, the fiery, charismatic founder of TST’s Detroit chapter who’s since been kicked out of the group for a performance-art piece in which she called for the execution of all presidents. (Lane has that on tape, too.) The tension between Greaves, who believes in using the system to protect the separation of church and state, and Blackmore, who likes her feminist protests to double as shocking performance art, lays bare the growing pains that any radical group goes through in its slow climb to respectability. It’s commendable that Lane includes this conflict in her otherwise glowing documentary, and if Greaves ends up coming off as the voice of reason in Hail Satan?, that’s simply because he chooses his words very carefully. (“Respectability” is still a relative term when it comes to devil worship, and TST co-founder Malcolm Jarry keeps his face obscured in interview segments.) That being said, Blackmore’s feminist spin on satanic philosophy is underplayed: One scene sees her dragging a cross through the streets of Detroit wearing a crown of thorns. But the purpose of the demonstration, a protest against anti-choice legislation in the state, isn’t explained in the same level of detail as Greaves’ ongoing campaign to have a matching Baphomet for every Ten Commandments monument in America. As for the devil worship thing, that’s a misconception: Although an “atheistic religion” seems like a contradiction in terms, The Satanic Temple does not worship Satan as a literal god. They just like the symbolism of Satan as the ultimate rebel, and love freaking out squares. (The overlap between metalheads/punks and satanists is significant.) The lack of mysticism in contemporary satanism naturally brings up the question of how much of this is sincere and how much is a put-on. 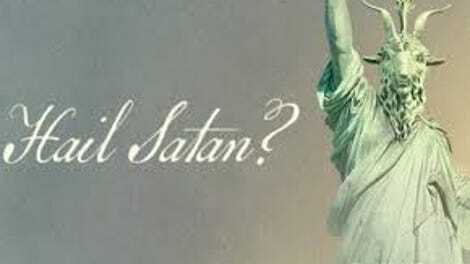 The answer to that question, which is woven throughout Hail Satan?, is kind of both? It’s certainly a postmodernist concept, presented in a media-savvy way. But the activist element of TST, which Greaves describes as the “natural evolution” of satanic thought, gives their actions a level of sincerity that was never present in Anton LaVey’s trolling Black Masses. And their fight is real in Trump’s America: Just last week, Ohio passed a bill essentially banning abortion in the state by prohibiting it after six weeks—before most people even realize they’re pregnant. Lane chooses to keep Hail Satan? on the lighter side, using cheeky musical cues and ironic stock footage—the infamous 1994 police training video Law Enforcement Guide To Satanic Cults appears at one point, as do Bible cartoons, Porky Pig, and Rosemary’s Baby—to make Satan seem friendly and fun. That’s probably necessary, given the millennia of bad press he’s received. And Lane’s lighthearted approach will probably convert more than a few viewers to the TST cause—it’s a short walk from pissed-off atheist to smirking satanist. Given how entrenched the culture wars have become in America, maybe all Satan needs at this point is a good publicist. What’s the best version of Satan in pop culture?